Metso is addressing the growing demand for mobile track-mounted crushing plants by commissioning a new, faster assembly line at the Tampere factory. The assembly of a 50-tonne, track-mounted crushing plant now takes two working days. 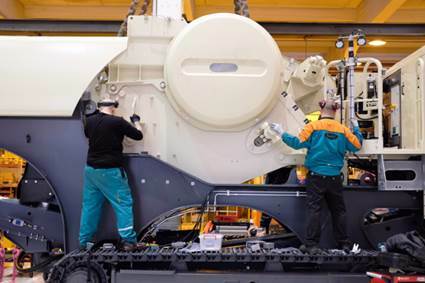 The serial production line operates in two shifts and increases Metso's mobile crushing plant production capacity by 25 percent. "Demand for mobile Lokotrack® crushers for aggregates took an upward turn 18 months ago, so the timing of our investment in capacity growth was right. We want to ensure that our production capacity can meet customers' growing needs," says Markku Simula, President, Aggregates Equipment business area at Metso. 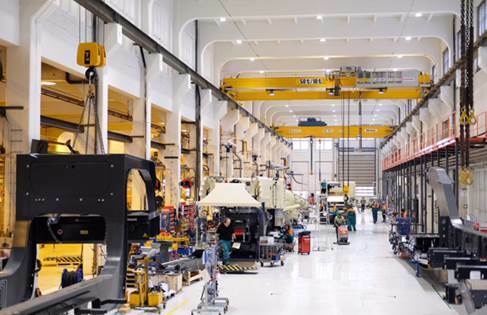 "Quality of Metso engineering has an excellent reputation around the world. This has helped Tampere become a global technology hub for Metso's track-mounted crushers," Markku Simula adds. The new high-speed assembly line has six assembly stations instead of the previous five, thus improving the line's flexibility and shortening the overall assembly time. Currently, the line is used for assembling the most popular crusher models. Assembly of also heavier and more complex models will begin in spring. The first Lokotrack model rolled off the new assembly line in the second week of January. The start-up has proceeded as planned. Based on the current plan, the assembly line will complete about 200 crushing plants before summer. "Continuous production development is part of our operating method. This investment shortens the delivery times of our most popular models and further improves occupational safety. The new assembly line has also enabled us to reorganize production and implement new operating methods," says Project Manager Juha Erkkilä. Over the past three decades, more than 7,000 Lokotrack crushing plants have been manufactured in Tampere. The manufacturing operations have also expanded to India and China. The Internet of Things and new environmental requirements are reflected in the product development. Today, the operations of a Lokotrack crusher can be remotely monitored from any location via a satellite connection. Noise protection and reduced dust emissions minimize the environmental impacts, making it possible to operate crushers even in dense urban areas.